Taking stock of the aftermath. 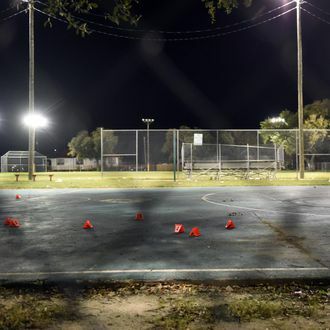 Police in New Orleans are looking for information that could help explain what happened to make a block party at Bunny Friend Park quickly turn violent on Sunday evening. Hundreds of people were gathered in the Upper Ninth Ward park for a BBQ and block party to celebrate the Nine Times Social and Pleasure Club, one of the area’s legendary second-line parade groups. The band had just begun filming an impromptu music video when two groups started firing at each other, just after 6 p.m. When the gunfire subsided, 17 people were injured. Some had multiple bullet wounds. Details about the shooters are still murky, but multiple witnesses reported seeing a man with a silver machine gun fleeing the scene. Nothing else is currently known about the identities of the other shooters, but a manhunt is under way.